Brush your teeth for 2 minutes twice a day for dramatically whiter teeth WITHOUT MESSY TRAYS! Combine the 3.6 oz. tube of Accelerator with a bit of Supersmile Toothpaste. The components work in tandem to safely and gently bleach & clean the teeth. Completely safe to the enamel. Restores bonding, veneers, caps and even dentures to their original whiteness. On a DRY toothbrush combine the whitening accelerator with an equal amount of toothpaste. Brush vigorously in small circles for 2 minutes, twice a day. I'm using the accelerator and don't see any difference. I'll stick with the toothpaste but the accelerator I believe is a waste. 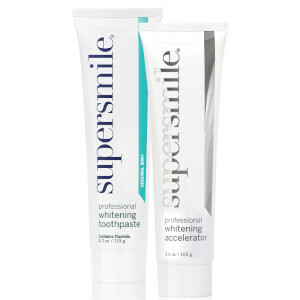 SuperSmile toothpaste / accelerator definitely removes stains and whitened my teeth to their natural color or a bit whiter. I saw results in just a couple of days and have used it for over a year. I will not be switching toothpaste. The price is high, but far less than dangerous OTC whitening systems. For the money, you won't find a better product. My only complaint is the tube is such heavy weight plastic that it's very difficult to get the last bit out of the tube. Also, don't bother using the convenient flip-top ... it's a messy and wasteful feature (in this case). Just unscrew the entire top and use as you would any regular tube of toothpaste so as not to waste any product. Supersmile products really do work very well. I've tried quite a few whitening products, and usually they leave my teeth so sensitive that it's uncomfortable to use them. This system creates no sensitivity, and if you use it, it will make your teeth much more white. I recently received some proof of this: I had to go to the dentist recently as I had to have two old crowns replaced with lovely new porcelain crowns. My dentist is an artist, and creates the crowns in her office while you wait. They match your teeth to little strips, then create the crown in that color. She had to go significantly whiter than the average tooth whiteness of most people. I was like, "Yes, go Supersmile!" So, give it a shot and see what you think. Considering all the hype, results weren't as good as I thought they should be. It's not the greatest product but it's not terrible either.